Despite spending the last decade or so of his career often injured, Ken Griffey Jr. was a 13-time All-Star, a 10-time Gold Glove winner, a 7-time Silver Slugger award winner, 1997 MVP, 6th all-time in career home runs with 630, and he accumulated nearly 80 WAR (more on “WAR” in the Bonus Facts below). Any number you look at, it’s clear Ken Griffey Jr., nicknamed “The Kid,” was one of the greatest players ever to step onto a baseball field. He became a superstar when he was only 19 years old, starting in center field for the Seattle Mariners in 1989. But just because someone is successful, famous, and rich (it’s estimated he made over $150 million during his playing career) doesn’t mean they can’t be sad or, even, depressed. After becoming one of the biggest can’t-miss prospects in baseball history, at the age of 18 the man who would not only be known for that beautiful swing, but also for his infectious and seemingly constant smile, attempted suicide. 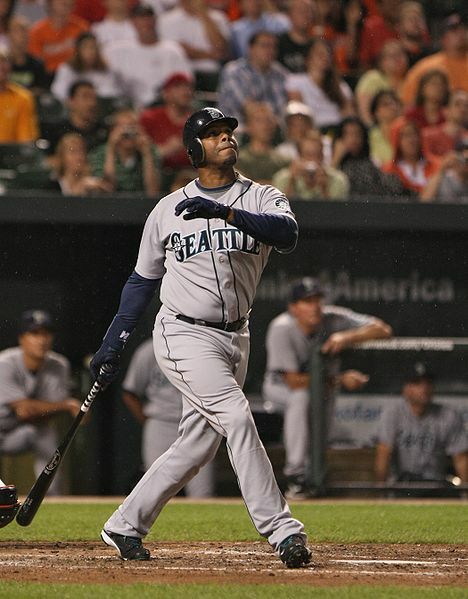 Ken Griffey Jr. grew up in a baseball-centric household. His father, Ken Griffey Sr., was a very good Major Leaguer in his own right. A three-time All-Star, Griffey Sr. was probably most well-known for being an integral part of the 1970s Cincinnati Reds, who were nicknamed “The Big Red Machine” and won back to back World Series titles in 1975 and 1976. “Junior,” as his dad’s teammates came to know the younger Griffey as, was often around the Reds’ clubhouse during these years. Johnny Bench, the Reds’ Hall of Fame catcher, once said (jokingly) in an ESPN chat that he saw Junior “stealing stuff out of my locker when he was 8.” Despite his apparent closeness with his father, they fought a lot, according to Junior. “It seemed like my father and I were always fighting,” Junior said in a 1992 interview. “I know a lot of kids go through that with their families, but it was hard for me.” Junior also said that both he and his father were stubborn and intense, both good traits to have as professional athletes, but not always good when it comes to two such people’s personal relationship. Junior got better and his relationship with his father improved. “The problem was with me and my father… There weren’t any deep problems with me afterwards,” Junior stated in a 1992 interview. Junior was in the Majors the next season, 1989, starting in center field for the Seattle Mariners. On August 29th, 1990, the Seattle Mariners signed Ken Griffey Senior, at the age of 40, to a contract for the remainder of the season. Two days later, on August 31st, Junior and Senior became the first father-son combo to play in the same Major League game. On September 14th, in a game against the California Angels (who ended up winning the game 7-5), Ken Griffey Sr. strode to the plate in the bottom of the 1st and promptly drove a two strike pitch into the stands. Junior was the next hitter and he waited for three balls before he slammed the next offering out of the park. Junior and Senior had hit back to back home runs, claiming another distinction in baseball history as the only father-son combo to hit back to back homers. Don’t ever try to commit suicide… Talk to people. Go another way. Don’t kill yourself. It ain’t worth it and I’m a great example… I am living proof how stupid it is…. No matter how bad it seems at the time, work your way through it. Who knows how your life is going to turn out? For those not familiar with the baseball stat “WAR”, it is simply a stat that attempts to encapsulate how valuable a player is vs. an arbitrary “replacement level” player. A replacement level player is basically any “AAAA” caliber player- the type that tend to bounce between AAA and the Major Leagues and can often be found on the bench with Major League clubs. These players are typically easy to find and acquire; most teams have no problem finding replacement level players when they need them. As such, this was chosen to be used as the base for WAR. A zero WAR player then is simply a replacement level, typically league-minimum type player. For reference, a Major League average position player or starting pitcher tends to be worth around 2 WAR (worth two wins more in a full season than an equivalent replacement level player). A team with nothing but replacement level players (all 0 WAR) should win between 45-50 games in a 162 game season. The highest career WAR of any player to date is Babe Ruth at 168.3. Although, it should be noted that Ruth’s numbers are likely heavily skewed by the era he played in. For instance, famed player and manager John McGraw once noted that Ruth couldn’t hit “soft stuff” to save his life and McGraw used this to his great advantage when his team faced Ruth and the Yankees in the playoffs, typically shutting him down completely when he had a pitcher who had decent breaking pitches on the mound. If that’s true, Ruth would likely have not been very good as a hitter in the modern era. Sluggers that can “hit a fastball very much” but not hit breaking balls are a dime a dozen and tend to have spectacular AAA careers, and sometimes good baseball careers in Japan, while floundering in the big leagues. The real question then is would Ruth have been able to adjust to modern pitching if he saw a consistent diet of breaking balls? If so, he probably would have been as good as ever. If not, he might not even have lasted more than a season or two in the bigs. In either case, Ruth was certainly the best player of his era, with nods to Ty Cobb, but it’s not completely fair comparing his numbers to modern era baseball players, for a variety of reasons. The highest WAR totals of position players in the modern era are Barry Bonds (163.6), Willie Mays (149.9), and Hank Aaron (136.2). The highest WAR totals of a pitcher (unfortunately because of lack of statistical data currently only goes back to 1980) goes to Roger Clemens at 139.9 WAR. Clemens is followed by Greg Maddux (114.3), Randy Johnson (110.3), Nolan Ryan (106.1), and Pedro Martinez (86.8). On August 10, 2013, Ken Griffey Jr. was formally inducted into the Mariners Hall of Fame. More recently, July 24, 2016, he was inducted into the Baseball Hall of Fame, being one of the few super star sluggers from the “steroid era” of baseball that seemingly played the game completely clean. In 2000, Junior has said that he received over 350 death threats. Once, he said, he had to play in a game in St. Louis knowing the FBI was watching over his wife and kids in the stands after receiving a message threatening them. The Drafting of Ken Griffey Jr.